Justice must be upheld. No nation, big or small, should be allowed to occupy a sovereign territory of another country. The UN Security Council, therefore, should make clear that Ethiopia’s belligerent and illegal behaviour is unacceptable. Today 13th April is the day when 14 years ago in 2002 the Eritrea-Ethiopia Boundary Commission (EEBC) composed of five (2 British, 2 American and 1 Nigerian) internationally renowned arbitration judges unanimously decided that the disputed town of Badme is a sovereign Eritrean territory. It is to be recalled that the Algiers Peace Agreement of 12 December 2000 signed by the leaders of Eritrea and Ethiopia, and guaranteed by the UN and OAU/AU as well as witnessed by the United State of America and the European Union established the Eritrea Ethiopia Boundary Commission (EEBC), in order to determine the location of the boundary between the two neighboring countries in a Final and Binding Award. In accordance to its mandate and after hearing the legal arguments of the parties for more than two years, the EEBC completed and delivered its Final and Binding Delimitation Award on 13 April 2002 and immediately commenced the process of demarcation. The Final and Binding Demarcation phase was as clearly applicable to the Delimitation phase. On 30 November 2007, the Commission also sent to the parties signed copies of 45 maps on a scale of 1:25,000 containing the demarcation of the Boundary by coordinates and deposited a copy in the Office of the UN Cartography for public reference. Thus, Ethiopia’s diplomatic maneuver under the pretext “dialogue” aside, the border between Eritrea and Ethiopia is unequivocally Demarcated by the EEBC. Final and Binding means final and binding. Ethiopia has constantly attempted to disguise its non-acceptance of the EEBC Final and Binding Delimitation and Demarcation Decisions by a variety of transparent stratagems, none of which has any legal basis.First, it claimed to be seeking an “interpretation” of the Delimitation Award in a lengthy request to the Commission that (as the Commission explicitly noted in its rejection of the Ethiopian request) was nothing more than a substantive complaint against the Commission’s decision about the location of the Eritrea-Ethiopia legal boundary.Then it began to resettle Ethiopians who had never lived in the border region into the territory that the Commission had just recognized and awarded as Eritrean sovereign territory, ignoring the Commission’s order that this illegal settlement program be immediately terminated. Its current stratagem, such as “dialogue”, is to demand that Eritrea negotiate over the location of the boundary, claiming that “the Commission had made errors” in its Delimitation and Demarcation Award that the two countries had to rectify. There is nothing to rectify. Once again it must be underlined that both countries have signed that the Delimitation and Demarcation decision of the EEBC to be Final and Binding. 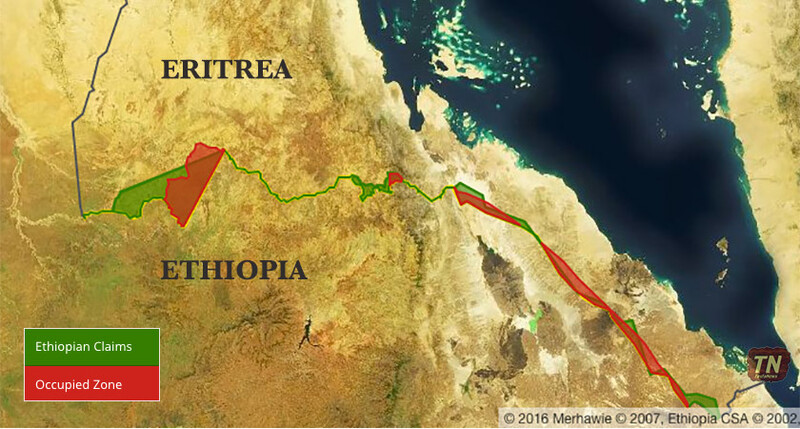 Neither Eritrea nor Ethiopia has the veto power over the Boundary Commission’s Final and Binding Delimitation and Demarcation Decisions. Nothing in the Algiers Agreement gives Ethiopia the right to reject, question and amend the Final and Binding Delimitation and Demarcation Decisions of the EEBC as well as to impose conditions on Eritrea. Ethiopia is not entitled to demand concessions of any kind as a “quid pro quo” for vacating sovereign Eritrean territory, including the town of Badme. Ethiopia is clearly asking and demanding that Eritrea cede its sovereign territory to Ethiopia in a process that it calls “dialogue”. Such “dialogue” is nothing more than holding Eritrean territory hostage in order to extract concessions. If Ethiopia wants to improve relations with Eritrea, it must respect its treaty obligations and the UN Charter by immediately and unconditionally withdrawing from sovereign Eritrean territory it occupies including the town of Badme. If Ethiopia is allowed to shirk its treaty obligation by challenging the authority of the EEBC, a body which was fully mandated by the UN Security Council to make a Final and Binding Decisions, then Eritrea will face an infinite series of additional demands, with Ethiopia requesting and imposing new conditions under the pretext of “dialogue”. The precedence that condoning such belligerent and illegal behavior by Ethiopia would entail is immensely dangerous to the resolution of boundary conflicts and stability of international borders, undermining the respect that states must give to the peace treaties they sign under Chapter VII of the UNSC. No matter how much Ethiopia wishes to exert some unlawful veto power over EEBC’s Award under the guise of demanding “dialogue”, such veto power is totally inconsistent with the terms of the Algiers Agreement that is signed by the leaders of the two countries in 2000 and the EEBC’s Final and Binding decisions that were endorsed by the UNSC. “The parties agree that the delimitation and demarcation determinations of the Commission shall be final and binding. Each party shall respect the border so determined, as well as the territorial integrity and sovereignty of the other party”. Therefore, on the bases of Article 14 of the Algiers Agreement which clearly calls for “appropriate measures to be taken under Chapter VII”, the UNSC must demand Ethiopia to unconditionally and immediately withdraw from sovereign Eritrea territory it occupies, including the town of Badme. The UN and AU guaranteed as well as US and EU witnessed Algiers Agreement must be respected. Last but not least, justice must be upheld. No nation big or small should be allowed to occupy a sovereign territory of another country. As to the issue of “dialogue”, once respecting the EEBC’s final and binding delimitation and demarcation decisions, Ethiopia ends its occupation of sovereign Eritrea territory, including the town of Badme, Eritrea is ready and willing to normalize its relations with Ethiopia and to engage in constructive dialogue on issues that are relevant and beneficial to the people of Ethiopia and Eritrea as well as to the stability of the Horn of Africa and the Red Sea region.